Hello everyone! A week of intensive training has just ended. Tomorrow morning our team is leaving for Norway to participate in the 2014 Chess Olympiads. You might recall that we won the previous Istanbul 2012 Olympiads, and so we have to do our best to defend our title. 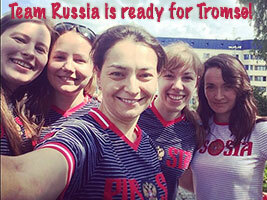 Our team will be comprised of (from left to right on the photo) WGM Natalija Pogonina (2508), GM Valentina Gunina (2501), GM Alexandra Kosteniuk (2533), WGM Olga Girya (2493), and GM Kateryna Lagno (2540). There will be fierce competition especially from China, Ukraine, Georgia, India so the Olympiads will be wonderful to follow! Below are some photos taken the last 2 days of our training camp (subscribe free to Chess Queen™ Alexandra Kosteniuk’s Instagram feed), enjoy! My 2012 competition chess year is over! It was filled with interesting games, exciting discoveries, beautiful combinations and sad omissions. 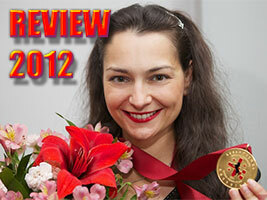 In this post I review my 2012 chess year so I can move forward to my competition year 2013. Overall the year 2012 was quite successful for me – I increased my rating by 50 points to 2495 Elo as well as got new great rapid (2575) and blitz (2581) ratings. I was able to win several important events. In this post I share with you (in Russian for the moment – use Google Translate for full text in English – but you get to see the photos and games) the most important and memorable events of 2012. 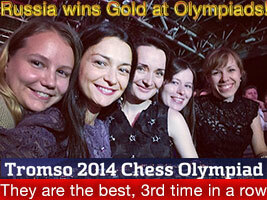 Alexandra Kosteniuk’s Russian Team wins the Istanbul Chess Olympiads! I am pleased to report that we managed to repeat our success of last Olympiad in Khanty-Mansiysk and won again in Istanbul. In the final round we crushed the team of Kazakhstan 4-0 who had drawn with China 2-2 the round before. Our winning team was made of the sisters Tatiana and Nadezhda Kosintseva, Valentina Gunina, Natalija Pogonina and me, Alexandra Kosteniuk. See the full results, an interview, and our Russian team results. Besides getting Gold medals for our team, Nadezhda Kosintseva on 3rd, Natalija Pogonina on 5th and I on 4th managed to get medals on our boards. It’s very difficult to actually win an event when everybody says you’re favorite to win, so I’m glad it worked out. There were many very strong teams out there, especially of course China and Ukraine, who ended up on the podium with us. In the next few days I will publish here some of my games of the Olympiads, so come back soon to visit! 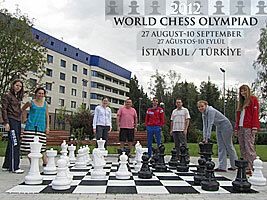 The world is watching the games and the results of the 2012 Istanbul Chess Olympiads, on the official site or on Chess Blog, it’s the biggest chess event of the year. 5 rounds have been played, see the results page. There are 6 more to go, so anything is possible. On the photo to the left you can see our Russian women’s team, with coaches, having a rest moment at a coffee shop today Sunday. If you tried to recognize all the players, they are: Rublevsky, Pogonina, Kosteniuk, N. Kosintseva, Dokhoian, T. Kosintseva, Riazantsev and Naer. That’s a powerful Elo average of approx. 2582! 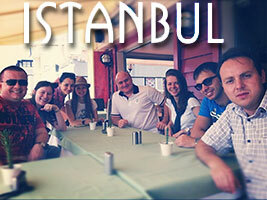 Below you can find some more photos of today’s tourism in Istanbul. We have three coaches dedicated to our women’s team: GM Sergei Rublevsky (2693), GM Alexander Riazantsev (2712), and GM Evgeniy Najer (2664). If you have an iPhone or iPad you can follow the results at any moment with the free 2012 Olympiad iOS app. 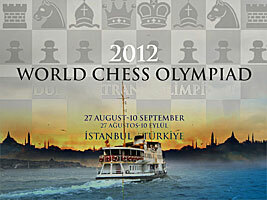 Next week I am flying to Moscow for our team’s preparation for the upcoming Istanbul 2012 Chess Olympiads. The World Chess Olympiad is an enormous chess event, up to now already at least 160 countries registered to play in Istanbul! The women’s Russian national team comprises, in order of boards: Tatiana Kosintseva, Valentina Gunina, Nadezhda Kosintseva, Alexandra Kosteniuk, and Natalija Pogonina. Our team should be one of the favorite to win, and we are the defending champions gold medal winners from the 2010 Khanty-Mansiysk Olympiads.